I found interesting article about chemtrails and how they could use them as a medium for directed energy weapons like HAARP for example. 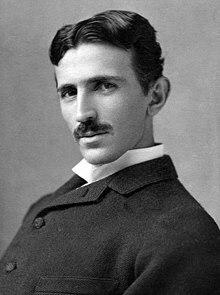 Nikola Tesla (Serbian Cyrillic: Никола Тесла; 10 July 1856 – 7 January 1943) was a Serbian–American inventor, electrical engineer, mechanical engineer, physicist, and futurist best known for his contributions to the design of the modern alternating current (AC) electricity supply system. Tesla’s achievements and his abilities as a showman demonstrating his seemingly miraculous inventions made him world-famous. Although he made a great deal of money from his patents, he spent a lot on numerous experiments. He lived for most of his life in a series of New York hotels although the end of his patent income and eventual bankruptcy led him to live in diminished circumstances. Tesla still continued to invite the press to parties he held on his birthday to announce new inventions he was working and make (sometimes unusual) statements. Because of his pronouncements and the nature of his work over the years, Tesla gained a reputation in popular culture as the archetypal “mad scientist“. He died in room 3327 of the New Yorker Hotel on 7 January 1943. Tesla’s work fell into relative obscurity after his death, but since the 1990s, his reputation has experienced a comeback in popular culture. His work and reputed inventions are also at the center of many conspiracy theories and have also been used to support various pseudosciences, UFO theories and New Ageoccultism. In 1960, in honor of Tesla, the General Conference on Weights and Measures for the International System of Units dedicated the term “tesla” to the SI unit measure for magnetic field strength. This paper documents where in his writings the description of this new generator is found, a theory of how a fuelless generator could work and a suggestion as to how Tesla’s new device might have operated. Ten years after patenting a successful method for producing alternating current, Nikola Tesla claimed the invention of an electrical generator that would not “consume any fuel.” Such a generator would be its own prime mover. Two of Tesla’s devices representing different stages in the development of such a generator are identified. While in college Nikola Tesla claimed it should be possible to operate an electrical motor without sparking brushes. He was told by the professor that such a motor would require perpetual motion and was therefore impossible. In the 1880’s he patented the alternating current generator, motor, and transformer. During the 1890’s he intensively investigated other methods of power generation including a charged particle collector patented in 1901. When the New York Times in June of 1902 carried a story about an inventor who claimed an electrical generator not requiring a prime mover in the form of an external fuel supply, Tesla wrote a friend that he had already invented such a device. Fuelless electrical generation raises the same objection of perpetual motion as did the generator in use today when it was first proposed. Research Nikola Tesla carried out during his second creative period and the resulting devices that were the basis for his assertion of fuelless electrical generation will be examined. Whether Tesla’s fuelless generator was a “perpetual motion scheme” of the sort his teacher warned him against, or a creative application of recognized natural phenomena will be discussed. This new power for the driving of the world’s machinery will be derived from the energy which operates the universe, the cosmic energy, whose central source for the earth is the sun and which is everywhere present in unlimited quantities. burning fuel. What became of Figueras and his fuelless generator is not known, but this announcement in the paper prompted Tesla, in his letter to Johnson, to claim he had already developed such a device and had revealed the underlying physical laws. The sun, as well as other sources of radiant energy, throw off minute particles of matter positively electrified, which, impinging upon [the upper] plate, communicate continuously an electrical charge to the same. The opposite terminal of the condenser being connected to ground, which may be considered as a vast reservoir of negative electricity, a feeble current flows continuously into the condenser and inasmuch as the particles are … charged to a very high potential, this charging of the condenser may continue, as I have actually observed, almost indefinitely, even to the point of rupturing the dielectric(1). This seems like a very straightforward design and would seem to fulfill his claim for having developed a fuelless generator powered by cosmic rays, but in 1900 Tesla wrote what he considered his most important article in which he describes a self-activating machine that would draw power from the ambient medium, a fuelless generator, that is different from his Radiant Energy Device. Entitled “The Problem of Increasing Human Energy – Through the Use of the Sun,” it was published by his friend Robert Johnson in The Century Illustrated Monthly Magazine for June 1900 soon after Tesla returned from Colorado Springs where he had carried out an intensive series of experiments from June 1899 until January of 1900. He quickly came to realize that an ordinary electrical machine, like his generator, would not be able to directly extract energy from the cosmos and turned his efforts to what he called a “turbine” design. The best known turbine, that is, water pump, associated with Tesla is his patent for such a device, #1,061,206, which was filed for in 1909 and granted in 1913. The unique point about this water pump is that instead of using some form of paddle wheels inside a box to move the water, he discovered that more water could be moved faster by using a set of flat metal disks. The turbine is, in itself, fascinating and may yet prove to be another important overlooked invention, but what is of concern regarding the electrical design is the general shape of the turbine – metal disks turning inside a supporting box. This same shape turns up in another patent, this one for a “Dynamo-Electric Machine.” This patent was filed and granted in the same year that Tesla said he returned to work on the “self-activating” machine, in 1889. The dynamo consists of metal disks that are rotated between magnets to produce an electric current. Compared to his alternating current generator, this “dynamo” represents something of a curious throwback to the days of Faraday’s early experiments with a copper disk and a magnet. Tesla makes some improvement over the Faraday setup by using magnets that completely cover the spinning metal disks and he also adds a flange to the outside of the disks so current can be taken off more easily – all of which makes for a better generator than Faraday’s. On the surface, though, it is hard to see why Tesla patented such an anachronistic machine at this point in his work. The next piece of the puzzle is found in an article Tesla wrote for The Electrical Engineer in 1891 entitled “Notes on a Unipolar Dynamo.” Here Tesla presents an in-depth analysis of the Faraday disk generator, explains why it was an inefficient generator, describes his improved variations on the Faraday machine, and, at the bottom of the third page of the article, states that he has devised a generator in which “the current, once started, may then be sufficient to maintain itself and even increase in strength(4).” Then, at the close of the article, he states that “several machines … were constructed by the writer two years ago …”(5) Two years before the writing of that article was 1889. All the evidence points to the turbine-shaped Unipolar Dynamo as being Tesla’s first design for a machine that can continue to produce electricity after being disconnected from an outside source of power. Elsasser models the earth-dynamo, conveniently for this explanation, on the Faraday generator of a metal disk spinning over a bar magnet placed at the edge of the disk. He notes, also, that the bar magnet could be replaced by an electromagnet which could get its power from the spinning disk by attaching one end of the electromagnet’s wire to the outside of the disk and the other end of the wire to the metal rod running through the center of the disk. Elsasser then points out that an ordinary disk generator “could not maintain a current for very long because the current induced in the disk is so weak that it would soon be dissipated by the resistance of the conductor [the disk].” This conventional arrangement would not be an answer to “how currents could be built up and perpetuated to maintain the earth’s magnetic field.” He does, though, propose three options in the dynamo model that would explain the earth’s persistent magnetism. If we had a material that could conduct electricity a thousand times better than copper, the system would indeed yield a self-sustaining current. We could also make it work by spinning the disk very fast… a third way we could make such a dynamo self-sustaining … is to increase the size of the system: theory says that the bigger we make such a dynamo, the better it will function. If we could build a coil-and-disk apparatus of this kind of scale of many miles, we would have no difficulty in making the currents self-sustaining(6). Tesla did not have a material a thousand times more conductive than copper, neither was he able to spin a disk at the ultra-high speeds needed to produce such a current, nor did he plan on using a piece of rotating metal several miles in diameter. What he did was to use energy that is usually wasted in a generator and turn it into a source of power. Tesla’s design varied from that of Faraday in two major ways. First, he used a magnet that was bigger in diameter than the disk so that the magnet completely covered the disk. Second, he divided the disk into sections with spiral curves radiating out from the center to the outside edge. In the Faraday unipolar generator “the current,” as Tesla noted, “set up will therefore not wholly pass through the external circuit … and … by far the greater portion of the current generated will not appear externally…”(7) By having the magnet completely cover the disk, Tesla made use of the whole disk surface in current generation instead of only a small section directly adjacent to the bar magnet, as happened in the Faraday device. This not only increases the amount of current generated, but, by making the current travel from the center to the outside edge, makes all of that current accessible to the external circuit. More importantly, these modifications on the Faraday design eliminated one of the biggest problems in any physical system – the reaction to every action. It is this reaction that works to cancel out whatever effort goes into causing the original action. In an electrical system if there are two turns of wire wound next to each other and a current is sent through the wire, the current passing through the first loop will set up a magnetic field that will work against the current passing through the second loop. The spiral divisions in the disk cause the current to travel the full radius of the disk or, as in his alternative version of the generator, to make a full trip around the outside edge of the disk. Because the current is flowing in a large circle at the rim of the disk, the magnetic field created by the current not only does not work against the field magnet above the circular plate, as in conventional generators, but it actually reinforces the magnet. So as the disk cuts the magnetic lines to produce a current, the current coming off of the disk strengthens the magnet, allowing it to produce even more current. Like conventional direct current generators, the unipolar dynamo also functions as a motor if current is put into the disk while under the magnet, and this seems to be the last element that could make the device self-sustaining, that is, capable of generating a current after being disconnected from an outside source of movement like falling water or steam. Rotation is started by, say, a motor powered by line current. Both a generator and a motor disk are mounted in the magnetic enclosure. As the disks gain speed, current is produced which, in turn, reinforces the magnets, which cause more current to be generated. That current is, likely, first directed to the motor disk which increases the speed of the system. At a certain point the speed of the two disks is great enough that the magnetic field created by the current has the strength to keep the dynamo/motor going by itself. What process might have kept the unipolar dynamo operating after the powered start-up is speculation at this point, however two features of the generator are significant. First, when a resistive load, like a light bulb is added to the circuit, it lowers the voltage at the center of the disk. This lower voltage at the center means that there is a greater difference in voltage between the center and the outside edge of the disk than there was before the light bulb was added. As the difference between the center and the outside increases, the dynamo works harder and makes more current. Second, yet more important, the dynamo takes either very little, or no energy to keep going because the current coming off the generator is doing double duty. The current makes the bulb glow, but on its way from the generator to the filament in the bulb, it travels a path that adds to the momentum of the dynamo and, therefore, consumes energy at a very low rate. The process continues , it would seem, until heat losses in the filament equal the rotational energy of the generator’s flywheel. In terms of Elsasser’s criteria for a self-sustaining generator, the Tesla unipolar dynamo comes closest to satisfying the condition of a better electrical conductor. It is not that a new material is used, but a new geometry is applied so that the current does not create its own opposing forces. This is similar, but not equivalent, to having a better conductor. Whether or not the dynamo is in fact a “fuelless” generator it appears to be an ingenious feat of engineering that takes one of the basic principles of nature, an equal and opposite action for every action, and turns it, by the use of a novel circuit geometry, into a reaction that is additive to the original action. Instead of the opposite reaction slowing down the system that created it, the reaction adds energy to the system. Tesla, however, was not satisfied with his mechanical self-sustaining generator. The dynamo would provide the energy to run a single machine, but his vision was to light cities and in the 1900 Century magazine article he elaborated on the theory of such a machine. Energy, though, can be converted into different forms as it passes from a higher to a lower state. He said, “assume that the water, in its passage into the tank, is converted into something else, which may be taken out of it without using any, or by using very little power(9).” For example, if the energy of the ambient medium is taken to be the water, oxygen and hydrogen making up the water are the other forms of energy into which it could change as it entered the cylinder. Corresponding to this ideal case, all the water flowing into the tank would be decomposed into oxygen and hydrogen …and the result would be that the water would continually flow in, and yet the tank would remain entirely empty, the gases formed escaping. We would thus produce, by expending initially a certain amount of work to create a sink for…the water to flow in, a condition enabling us to get any amount of energy without further effort(10). It was also in 1893 that Tesla applied for a patent on an electrical coil that is the most likely candidate for a non-mechanical successor of his energy extractor. This is his “Coil for Electro-magnets,” patent #512,340. It is another curious design because, unlike an ordinary coil made by turning wire on a tube form, this one uses two wires laid next to each other on a form but with the end of the first one connected to the beginning of the second one. In the patent Tesla explains that this double coil will store many times the energy of a conventional coil(14). Preliminary measurements of two helices of the same size and with the same number of turns, one with a single, the other with a bifilar winding, show differences in voltage gain(15). In figure 6, the upper curve is from the Tesla design, the lower was produced by the single wound coil. The patent, however, gives no hint of what might have been its more unusual capability. What ties the Linde work with Tesla’s electromagnet coil is that both of them used a double path for the material they were working with. Linde had a compressor to pump the air to a high pressure, let the pressure fall as it traveled through a tube, and then used that cooled air to reduce the temperature of the incoming air by having it travel back up the first tube through a second tube enclosing the first(17). The already cooled air added to the cooling process of the machine and quickly condensed the gases to a liquid. Tesla’s intent was to condense the energy trapped between the earth and its upper atmosphere and to turn it into an electric current. He pictured the sun as an immense ball of electricity, positively charged with a potential of some 200 billion volts. The earth, on the other hand, is charged with negative electricity. The tremendous electrical force between these two bodies constituted, at least in part, what he called cosmic energy. It varied from night to day and from season to season but it is always present. The positive particles are stopped at the ionosphere and between it and the negative charges in the ground, a distance of 60 miles, there is a large difference of voltage – something on the order of 360,000 volts. With the gases of the atmosphere acting as an insulator between these two opposite stores of electrical charges, the region between the ground and the edge of space traps a great deal of energy. Despite the large size of the planet, it is electrically like a capacitor which keeps positive and negative charges apart by using a non-conducting material as an insulator. In order to tap this energy storehouse Tesla had to accomplish two things – make a “cold sink” in the ambient energy and devise a way of making the “sink” self-pumping. Explaining how this process might have worked requires, again, speculation. Such a “sink” would have to be at a lower energy state than the surrounding medium and, for the energy to continually flow into it, the “sink” would have to maintain the lower energy state while meeting the power requirements of the load attached to it. Electrical energy, watt-seconds, is a product of volts x amps x seconds. Because the period of oscillation does not change, either voltage or current has to be the variable in the coil’s energy equation. In that the double wound coil maximizes the voltage difference between its turns, it is probable that it is the current that is minimized to produce a low energy state in the coil. For the coil to be initially “empty” and at low energy would mean it operated at high voltage with a small amount of charge(19). The coil, then, would be set into oscillation at its resonant frequency by an external power source. During a portion of its cycle the coil will appear to the earth’s electric field as one plate of a capacitor. As the voltage across the coil increases, the amount of charge it can “sink” from the earth’s higher energy field will increase. The energy taken into the coil – through the “small opening” which appears to be the atomic structure of the conductor according to the physics of Tesla’s time – is “condensed” into positive and negative components of current, a lower energy state relative to the originating field. The current is equivalent to the water converted to gases in Tesla’s description of the self-acting engine. The current would “escape” from the “sink” into whatever load was connected across the coil. The movement of current into the load would produce a strong magnetic field (the stated intention of the patent) which, when it collapsed, would, again, produce a high potential, low charge “sink” to couple with the earth’s electric field. Because the inflowing energy performs a double function similar to the unipolar generator, supplying current to the load and aiding the pumping function, the system’s energy expenditure in moving charge is low, allowing the system to gain more energy from the medium than it expends in its operation. The coil needs no extra energy from an outside source to pump the energy it has extracted. …captains of industry…were afraid that they would have to scrap some of their direct current apparatus and the plants for manufacturing it, if the alternating current system received any support … ignorance and false notions prevailed in the early nineties, because the captains of industry paid small attention to highly trained scientists (20)(21). It has been nearly a century since Nikola Tesla claimed a radically new method for producing electricity. The need for the development of new resources is greater now than at the end of the last century. Perhaps these overlooked inventions will make his vision of “increasing human energy through the use of the sun’s energy” become a reality. In the 1910s and 1920s, Harry Perrigo of Kansas City, Missouri, a graduate of MIT, claimed development of a free energy device. Perrigo claimed the energy source was “from thin air” or from aether waves. Perrigo demonstrated the device before the Congress of the United States on December 15, 1917. Perrigo had a pending application for the “Improvement in Method and Apparatus for Accumulating and Transforming Ether Electric Energy”. Investigators report that his device contained a hidden motor battery. In 1917, John Andrews, a Portuguese chemist, had a green powder which he claimed and demonstrated could transform water into gas (referred to as a “gas-water additive”). [clarification needed] He reportedly convinced a Navy official that it worked. Andrews disappeared after negotiations began. Andrews’ laboratory was rummaged through and disheveled upon a return visit by United States Navy officials. [clarification needed] Also in 1917, Garabed T. K. Giragossian is claimed, reportedly fraudulently, to have developed a free energy machine. Supposedly involved in a conspiracy, Woodrow Wilson signed a resolution offering him protection. The device was a giant flywheel that was charged up with energy slowly and put out a large amount of energy for just a second. A series of designs were developed in the 1920s. During this period, Thomas Henry Moray demonstrated a “radiant energy device” to many people who were unable to find a hidden power source. On June 9, 1925, Hermann Plauson received U.S. Patent 1,540,998 which utilizes atmospheric energy. In 1928, Lester Hendershot got an Army commandant to endorse his free energy machine called the “fuelless motor”. At the close of the 1920s, Edgar Cayce in Chicago, Illinois, described “Motors with no Fuel” (Reading 4665–1; March 8, 1928). Lester Hendershot (1899-1960) was the inventor of the so-called Fuelless Motor (1928). In the 1920’s Lester Hendershot was working on a new type of aviation compass. He stumbled across a method of generating energy. His “Hendershot magnetic motor” drew attention of the press and attracted big name investors as Charles Lindberg. He got into political trouble promoting his device and consequently tried to take his business to Mexico. He is reported to have accepted an offer he couldn’t refuse being paid never to work on his device again. Not claiming his device to be a perpetuum mobile explained he that it was tapping the earth’s magnetic field and rotation as its energy source. The Hendershot Device concerns a self-running oscillator. There are a pair of large air-core coils positioned in a “basket weave” pattern, hand-made cylindrical capacitors inside the coils, several high-value capacitors, a couple of standard transformers and a permanent-magnet “buzzer” for a regulator. The two large coils are tuned to resonate with each other. The device generated an AC output and was capable of lighting a bank of lightbulbs. Only Hendershot could adjust his device for successful operation. Hendershot’s son attempted to reproduce his father’s discovery, but no success has been reported. “Hendershot ran into political difficulties in promoting his device, attempted to take his business to Mexico, and finally faded into obscurity.” Bill Beaty of KeelyNet. So there you have the first post of the series… and stay tuned for more FORBIDDEN TECHNOLOGY!